Shane van Gisbergen edged fellow last-gasp improver Fabian Coulthard to lead Practice 2 for the Coates Hire Ipswich SuperSprint. The Kiwis left it until after the chequered flag to make their moves to the top, van Gisbergen's 1:09.2447s fastest by 0.0838 seconds. Championship leader Scott McLaughlin missed the end of the session with his out-of-fuel Falcon stopped on track and was 12th in the order. Another brief downpour hit Queensland Raceway between sessions, however the track was all-but dry for the start of the 45 minutes. David Reynolds sat out the early phase but the Erebus driver was the first to break the 1:10s barrier when he did get going. His 1:09.9616s, nearly 10 minutes in, was beaten by Jamie Whincup's 1:09.8769s almost immediately. Reynolds, though, got back on top nearing the halfway mark, going two tenths clear with a 1:09.6570s. Chaz Mostert and van Gisbergen cut that margin back to 0.0894s and then 0.0394s, however Reynolds still led the way into the final runs. McLaughlin made his move with three minutes to go, as fresh rubber rolled out, with a 1:09.5714s to go ahead by 0.0296s. As McLaughlin ran out of fuel and stopped on track, Reynolds reclaimed the top spot, but was quickly unseated by Mostert. Van Gisbergen and Coulthard were sixth and 15th when the chequered flag came out, then vaulted up to first and second. The Red Bull Holden's 1:09.2447s was the best of Friday's 90 minutes of running. Coulthard was van Gisbergen's closest challenger, 0.0838s adrift, with the top 25 drivers covered by 0.7265s. 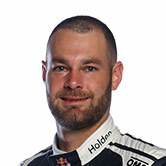 “It was a frustrating day, just running around on crap tyres," said van Gisbergen. "There’s been no wet races this year and we’ve finished all of them, so we’ve got no tyres left. “Everyone is in the same boat, but it’s just frustrating. You put a better set on and the car is good, all your problems are solved. 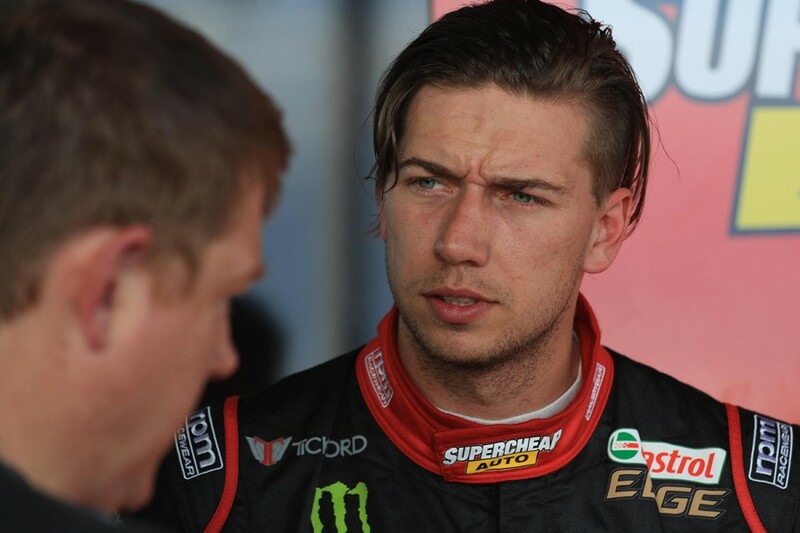 Mostert wound up third, with Tickford Racing team-mates Mark Winterbottom and lead rookie Richie Stanaway fifth and 10th. “It still needs a little bit of a tweak but overall I’m pretty happy,” said Mostert. “Hopefully tomorrow we can do a similar job. If we can stay up in that top five that’d be awesome. Rick Kelly jumped up to 17th from fourth with his final lap as the lead Nissan, having gone off at Turn 6 on an earlier run. Whincup and Reynolds fell to sixth and seventh, ahead of Michael Caruso and Craig Lowndes, while Simona De Silvestro was 11th in a third Altima. The Swiss driver had been fourth after setting her time in the dying minutes, before being bumped down the order. “We finally got to try something today that we’ve always been debating on trying and the car was really quick,” she said. “I’m really happy with that. It feels really balanced. We run a lot on old tyres, so it was a bit frustrating in the first session, but its’ getting there. McLaughlin had to settle for 12th with his fuel-less Falcon stopped between Turns 3 and 4, having earlier battled a suspected electrical gremlin. “I think we ran out of fuel halfway round that last lap, but it is what it is,” he said. “It was our last run and the boys weren’t able to fuel it up before the end there. After ECU and clutch problems in the first two sessions, wildcard runner Kurt Kostecki finally had a clear run, and wound up 26th of the 27 drivers. Practice 3 at 11:20am marks the start of Saturday's running at Queensland Raceway.